Oman Air Cargo has appointed ECS Group in the Benelux region of Europe. The contract, to be serviced by Globe Air Cargo (GAC), an ECS Group subsidiary, has comes into effect on April 1, 2017. The partnership will provide the carrier with overnight transit cargo volume to its gateways in Paris (CDG), London (LON) and Frankfurt (FRA). According to the contract, ECS will market Oman Air’s cargo network from its hub in Muscat (MCT) with flights to destinations in the Middle East, India and Asia. Oman Air utilises Airbus 330 aircraft across Europe. 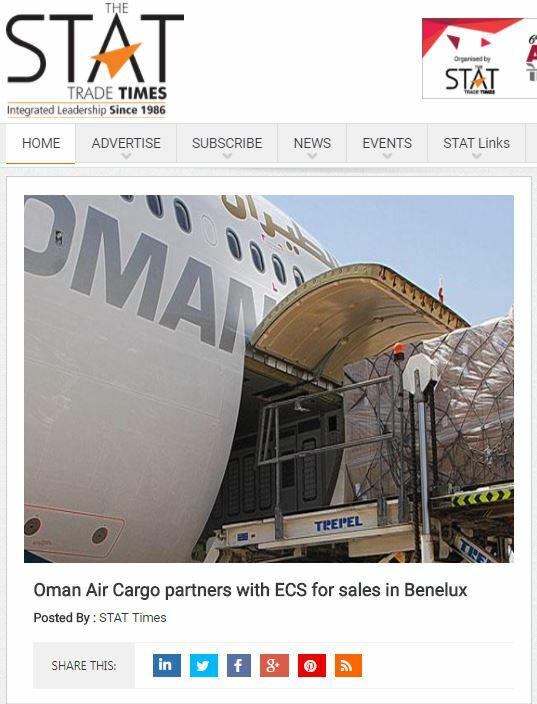 The ECS Group, through GAC, will represent Oman Air Cargo as an offline sales partner, and coordinate the trucking and handling of cargo on behalf of Oman Air from Brussels (BRU) and Amsterdam (AMS). This will allow Oman Air Cargo to consolidate cargo volume and eventually create a strong customer base in the Benelux market. Oman Air Cargo will service customers who are interested in dedicated ULDs to Muscat and to its other destinations across the Middle East, India and Asia. Among the type of cargo that will be generated will predominantly include general cargo of industrial goods. However, under the new contract GAC will help Oman Air to develop special and premium type of cargo that includes perishable and pharma, key cargo commodities that transit through Paris, London and Frankfurt. The cargo division of Oman Air has increasingly been focused on introducing a number of specialised products for high yield cargo commodities.